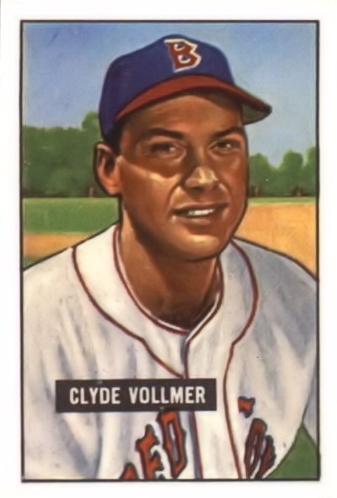 ON THIS DATE (July 26, 1951) ... Clyde Vollmer hit three home runs as he powered the Red Sox into a virtual first-place tie for the American League lead. The big right-hander produced six runs as the Red Sox outscored Chicago by a score of 13-10, to the delight of 21,679 fans at Fenway Park. Vollmer's third home run came with two aboard in the sixth inning and erased a 10-10 tie. The victory was credited to Ellis Kinder, who pitched three brilliant innings in relief, enabling the Sox to climb within two percentage points of the Yankees who lost to Cleveland 9 to 4. Vollmer's power party overshadowed the deeds of the other hitters, in one of the heaviest assaults on the left-field wall the season. Both teams rapped out a total of 31 base hits. Chicago's Eddie Robinson contributed a three run homer in the first inning, Ted Williams poked one over the wall in the second, and Dom DiMaggio slammed a two run job in the fifth. Vollmer slugged each of his home runs off different pitchers. His first one came off Luis Almoa in the first inning, clearing the wall and the net. His second one came at the expense of Randy Gumpert and barely made it over. The third one was slammed off Harry Dorish and went all the way down Lansdowne Street. Clyde didn't get to bat the fifth time and therefore didn't get a shot at a fourth home run, a record held by six major league players. Bobby Doerr turned the trick of three home runs last year, and was the last Red Sox player to do so. The first two innings lasted one solid hour, and at the end of the time the score was even at 7 to 7, thanks to Williams' game-tying homer in the end of the second. It stayed even until the fifth, when Vollmer knocked out his second home run. DiMaggio followed him, with one aboard, and gave Boston a 10 to 7 lead. In the sixth inning, the White Sox caught up to Chuck Stobbs to tie the score at 10 to 10. At that point Kinder came in and struck out Phil Masi to end the inning. In the Red Sox half of the inning, Doerr doubled off the top of the left-field wall and Billy Goodman walked. That was followed by Vollmer's third home run of the contest, his 18th of the season, giving the Red Sox a 13 to 10 victory. Over the final three innings, Kinder gave up only two hits and struck out five, in posting his seventh win against only one loss. Nearly lost in the headlines was DiMaggio's perfect day at the plate. In addition to his home run, he had four singles in five trips.